With the MPs expenses scandal back in full swing in the news, now is as a good a time as any for the Pleasance Theatre and the Charles Court Opera to revive Gilbert and Sullivan's light-hearted satire, Iolanthe. If you expect deep political insight however, you will be asking for a refund of your own expenses. Iolanthe is a fluffy bit of musical candy-floss, as light and inconsequential as the material of the dresses worn by the mischievous fairies, sisters to the eponymous character. G&S's attacks on the House of Lords, which may have seem risqué in 1882 when the operetta was first aired, are not very original any more and the plot itself is rather predictable. But political satire is not the point of the evening. It's all about fun. The cast are clearly having lots of it and so was the audience on the night we were there. The highlights of the evening were the ensemble piece at the end of the first part and (Martin Lamb) Private Willis' solitary performance at the beginning of the second. Simon Butteriss (the Lord Chancellor) is also worth a mention as part of an expert young cast. Because of the scale of the production, Sullivan's orchestral music has had to be (very successfully) arranged as a piano duet by the Eaton-Young Piano Duo, who are also performing it (just as successfully), dressed as what looked suspiciously like G&S themselves. If you find yourself on the dark windswept streets of N7, you could do much worse than joining that merry band and letting yourself be taken to fairyland, like the rest of them. 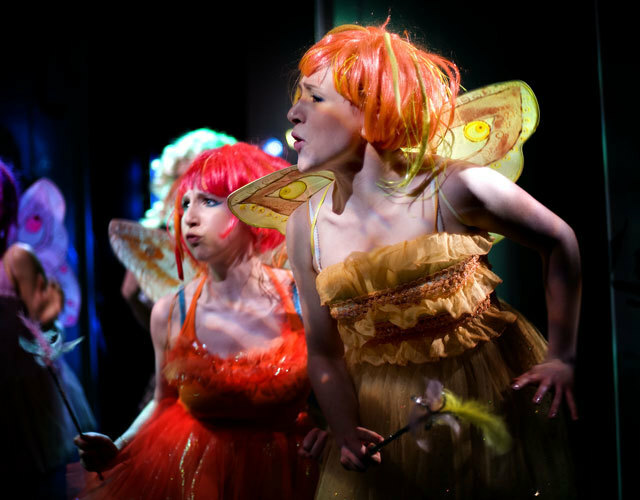 Iolanthe is at the Pleasance Theatre, Islington until 25th October. Wednesday - Saturday 7.30pm, Sundays 5pm, No performances Mondays and Tuesdays. Tickets: Sun - Thu £12 (£10), Fri & Sat £14.50 (£12.50). Image: Bill Knight.